When you think of Franz Liszt you think of his solo piano music, or perhaps his larger concert works like the concertos, thirteen tone poems and Faust Symphony. But, of course, he wrote much else, not just in the orchestral realm, but in the choral, song, and chamber genres. Here we have mostly rarely performed music for violin and piano, but not surprisingly the piano is often front and center in these works. Most of the music here is based on themes from other sources or has been reworked or arranged from other Liszt pieces. Having written this, I sense that some listeners might already be backing away from acquiring this CD, viewing its contents as hand-me-downs or as refurbished wares from the Liszt outlet. However, they are anything but. The Duo Sonata (c. 1832-1835) is an early work comprised of four movements, with thematic material based on Chopin's Mazurka in C Sharp minor, Op. 6 #2. 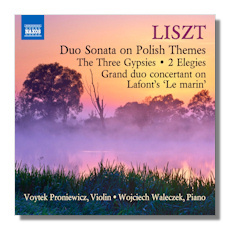 Liszt also employs music from various Polish sources. The work is light, folkish and full of color and brilliance. But it isn't a flashy piece of fluff: the first movement has a stateliness and drama to its folkish character, and you hear some of that typical Lisztian menace midway through, as if you've just taken a detour off the brightly lit main road and are headed into a threatening fog. The second movement begins with music that sounds as if Chopin is the composer, the theme catchy with hints of yearning or even melancholy. The middle section is playful in its folkish spirit and mischievous music for piano. The third movement is full of drama at the outset, but you soon realize it's all rather tongue-in-cheek, and again the music is very attractive and memorable. That same humorous spirit prevails in much of the finale, a rondo that moves from romping joy to a singing violin theme. The Epithalam for the Wedding Celebration of Eduard Remenyi (1872) is a brief work (4:38) that features a lovely rather gentle main theme which one would not associate with a celebratory mood. The middle section is triumphant and happy, but only briefly and then the mood returns to the lyrical beauty and peacefulness of the opening. Perhaps the most folkish sounding piece here is the next work, The Three Gypsies (1864). This composition started out as a song, then became a paraphrase for piano, and later was arranged for voice and orchestra. This rendition for violin and piano offers music firmly in the Hungarian Gypsy style, with music that sings and yearns and laughs and cries, with emotions tilting toward regret or sadness at the end. The two short �l�gies are drawn from piano pieces from 1874 and 1878 respectively, and are the most serious-minded works on the disc. That said, they are thematically and harmonically rather tame for late Liszt, and their textures are spare, their writing not particularly virtuosic. They are somber in mood and recall such late works as the two Lugubrious Gondolas, Nuages Gris, and Unstern. The Jenő Hubay arrangement of the Liszt Valse-Impromptu (1850-1852; rev. 1880) for piano is charming and quite colorful, offering stark contrast to the preceding �l�gies. The Grand duo concertant (1835) is based on a work by the French violinist and composer Charles Philippe Lafont. Here Liszt fashions a colorful theme-and-variations showpiece, boldly Romantic and offering plenty of challenges to the two players. Speaking of those two players, they consistently turn in splendid work here and in all the music on this disc. I'm not familiar with the careers of either violinist Voytek Proniewicz or pianist Wojciech Waleczek, but both certainly have the full measure of this music in hand. They completely grasp the multi-faceted nature of Liszt, from his folk-oriented side to his fiery Romantic character and onto to his somber introspective side. Their broad range of dynamics, subtle sense for mood, instrumental balancing, and technical skills are all first rate. Apart from the Elegy #2, Liszt's music for violin and piano has been relatively neglected over the years, but perhaps this disc will help rectify that situation. Fine notes by Keith Anderson (as usual) and excellent sound reproduction round out this splendid album.